Amazon rainforest snakes are fascinating animals to encounter in the jungle. If you are canoeing in the forest and catch sight of a giant anaconda coiled in the shallows, you cannot help but feel excited. When you spot whip snakes hiding amongst the lush green foliage, it’s as if every part of the Amazon Rainforest is alive. In this article I will talk about some of the encountered Amazon rainforest snakes you may find on your adventure. All of the photos on this page are from the Tahuayo lodge in the Peruvian Amazon (contact bubble in the middle of the page). Anacondas are the world’s heaviest snake at around 250 kg. They grow to about 10 metres and lead a semi-aquatic lifestyle made possible by the position of their eyes and nostrils on the tops of their head. They seem to choose areas with thick vegetation where they hide in the foliage. They hunt mainly at night eating most manageable animals like capybara and deer. Snakes in this genus (Chironius) are among the most abundant in all South American forests. They include both ground-living and canopy-living diurnal species that mainly prey on frogs but also take lizards and birds. The pictured species (Chironius bicarinatus) actively seeks out prey in shrubs and trees. Smart for a snake, there are records of this species investigating bromeliads for their frog prey. Bromeliads are often home to different frogs as the plants collect water. As mentioned in the article on rainforest snakes, bushmasters are a formidable South American viper and are the largest venomous snake in the western hemisphere. They are closely linked to ‘virgin’ or ‘pristine’ tropical wet forests and you may hear Amazon guides telling stories about encounters with this snake. Strangely for a neotropical pit viper, bushmasters lays eggs as opposed to giving birth to live young. Rainbow boas are very popular in the pet trade due to their beautiful colouration. They have iridescent scales giving this boa its common name. They feed on birds, lizards, and small mammals found in their range of northern and central South America. The South American coral snake is a beautifully patterned elapid (member of the elapidae family). There are over 70 different species found in warmer parts of the Americas identified by their individual patterns. Coral snakes feed on lizards and other snakes and are highly venomous. The photographed species is the aquatic coral snake (Micrurus surinamensis) from Amazonia. As an extra point, note that coral snake rhymes popular in North America do not work in other parts of the world due to the diversity of coral snake patterns. Like many venomous animals, to the human mind their beauty is somewhat sinister as instead of attraction their colouration is actually to warn animals of danger. This link between the visual signal and toxicity is known as aposematism. Some harmless animals try and intercept this link between appearance and danger by mimicking the look of dangerous attractive species. The harmless snakes that mimic the look of coral snakes are known as milk snakes and these live in North America and northern South America. I think the picture of the coral snake in the article is rather that of the King Snake. The king snake mimics the color of the coral snake. The key difference is that the coral snake color order is red, yellow, black, yellow, red. That of the King Snake is red, black, yellow, black, red. Another key difference is that the coral snake has a predominantly black head. The king snake’s head is predominantly red. Thanks Kan for your comment and help. The famous rules work exceptionally well in North America, but things start to get complicated when you head south. There are many different species of each king snake, coral snake, milk snake, ground snake, coffee snake and more with a diversity of similar patterns. The photographed species is one of the most attractive coral snakes, Micrurus surinamensis. Try Googling Aquatic Coral Snake. I should have mentioned that in the article. I was about to make the same comment as kan. Thanks for the clarification. Sorry Kan, you are dead wrong. I spent ten years in the jungle of Peru in the seventies and eighties. Aquatic? I am totally wrong. The “dead” word usage was a joke on poison. I apologize. 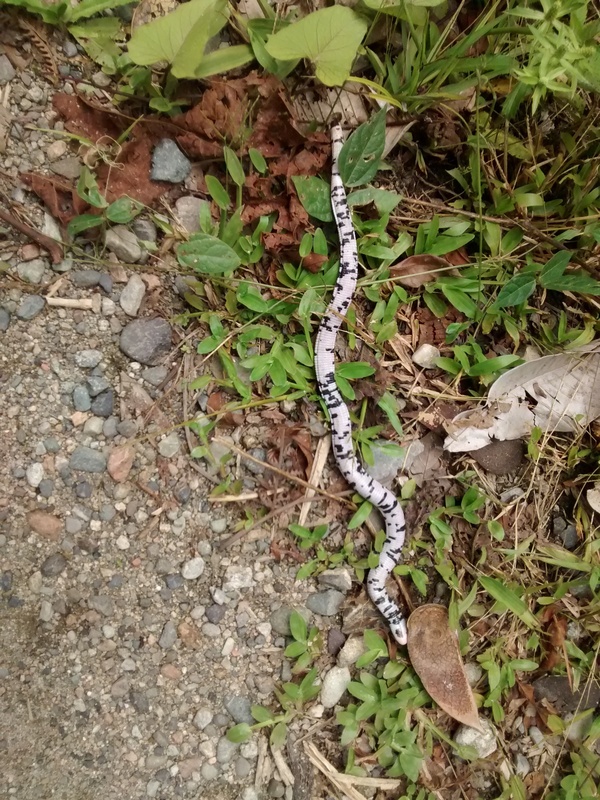 Its a milk snake that has some resemblance to the coral snake. A king snake doesn’t look anything like the coral. The milk snake and king snake are both collubrids. The coral snake is an Elapid. Thanks for your input, Ryan. The reptile database may help shed some more light on the snake, so to speak: http://reptile-database.reptarium.cz/species?genus=Micrurus&species=surinamensis. Take care when venturing to South America as things are not always as they seem. Any idea what this is? i spotted it in Ecuador near the Tena.